A smartwatch can be an expensive investment, one that you may not be too sure about quite yet, especially when you don’t have the opportunity to try it out before you purchase. Thanks to Lumoid, that all changes, as they have a system that allows you to try basically any Android Wear device for a 2-week period, then send it back if you don’t want to keep it. As for Lumoid’s smartwatch selection to choose from, it could use some updating. During IFA, we saw a ton of new Android Wear devices launched, so it will take time for Lumoid to stock up on all of the latest hardware available. For now, you can try out an ASUS ZenWatch, Moto 360 (1st Gen), LG G Watch, Samsung Gear Live, and even a Pebble. Basically, this would be a good test period for Android Wear in general, not necessarily the hardware, since I would not recommend most of these devices to potential buyers. When and if Lumoid begins to offer the next-gen Android Wear products, then it will become a very powerful service. 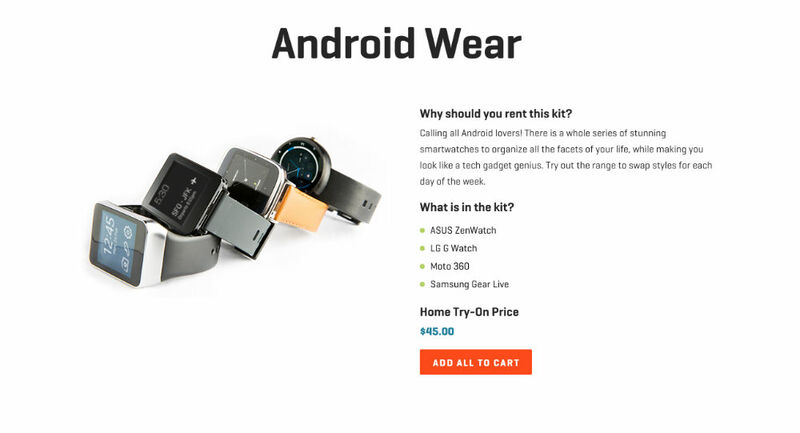 Below, check out the complete little breakdown of how it works, then check out their website if you are interested in test driving a few Android Wear products. Pick out whichever 5 wearables you’d like to try – options for Android users include Pebble, ASUS ZenWatch, LG G Watch, Moto 360, Samsung Gear Live and more. Input your shipping address (can be your home, hotel, or pretty much anywhere in the U.S.) and place your order. The cost to try out 5 wearables for 2 weeks is $25. Lumoid ships you your items through UPS or FedEx and sends you tracking info. Once your items arrive, open the box and enjoy!